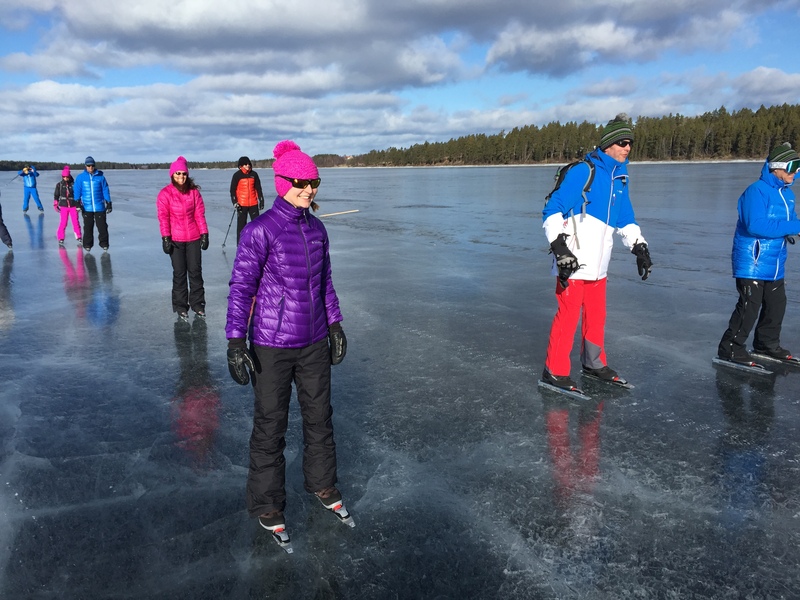 During my recent trip to Sweden with Columbia Sportswear and Jämtland Härjedalen Turism, we had the chance to try our hand at Nordic skating, with many of the group on skates for the first time. 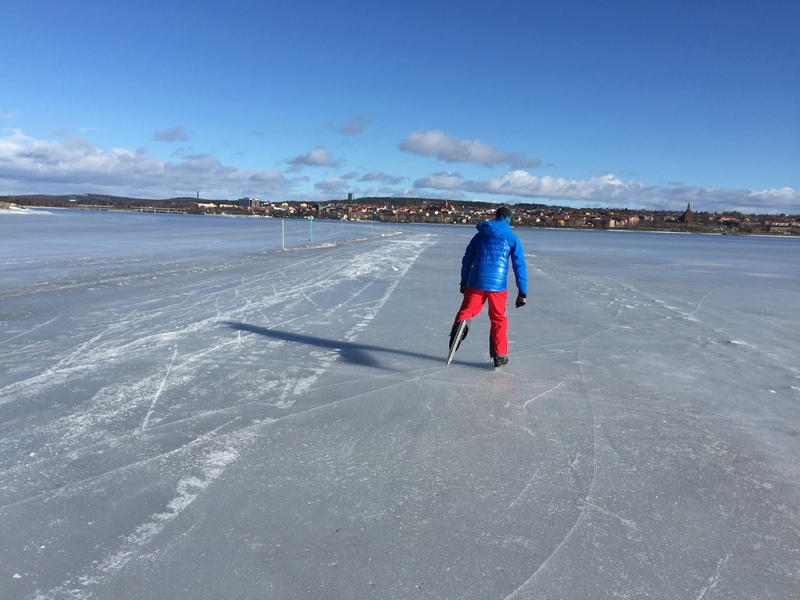 Upon arriving at the Östersund airport and after a quick serenade from the airport manager, we changed clothes and headed down to Lake Storsjön, Sweden’s fifth largest lake, to skate the final 12 km into town. The skating track, called Medvinden, is Sweden’s longest. The full 15 km track goes from the harbor in Östersund to the other side of the lake at Frösön and continues along the shore to Härke and Kungsgårdsviken at Frösön. The day was crisp and clear but with a heavy wind–easily over 20 mph. Fortunately (or unfortunately depending on how you look at it) for us, the wind was at our backs, meaning it did not take much effort to skate. You could simply stand up and hold on for dear life as the wind propelled you forward. Pity those who were not quite sure how to stop–the easiest way is by either snow plowing to slow yourself down, turning into the wind, or when all else fails, hockey stop (or even fall on your back). Nordic skating feels a bit like Nordic skiing, except you go much faster. Nordic skates glide twice as far as conventional skates as they remain on top of the ice rather than digging in. Long blades with curved tips similar to skis clip onto cross-country ski boots via a metal bar molded into the toe. The best boots for Nordic skating are skate or combination models from companies such as Alpina, Fischer, Rossignol, or Salomon, as they have good ankle support and stiffness. Your weight is evenly distributed over the longer blade, giving you more stability than figure skates or hockey skates and the curved tips allow you to glide through bumpier and even snowy terrain. Many of the skate trails in Sweden are groomed, and it is not uncommon for people to use them to commute to and from work. A bad snow year usually means a great skating year, so when the Swedes can’t ski, they simply throw on their skates instead. Wild game burritos prepared over an open fire. Sadly, I won’t find much Nordic skating in California but am determined to seek it out next winter. I think I have found a new calling. Now I can spend the winter chasing both vertical and horizontal wild ice. Apart from the Nordic skates, you need a few more essentials for a safe and fun day out. Poles: If you’re a complete beginner, poles really help you keep your balance and can be a big plus in windy situations. A pole is also good for testing the strength of the ice if not on groomed trails. The minimum set of safety equipment includes a set of Ice Claws to pull yourself out of a hole in the ice should you drop through. As our skating guide, Johan Ranbrandt, told us, “falling through the ice is all part of the game.” You will also need a Throw Bag with Floating Rope to rescue another victim from the icy waters. 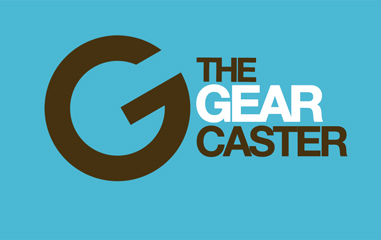 Finally, in case you do fall through, you are going to need a set of dry clothes sealed inside a drybag. 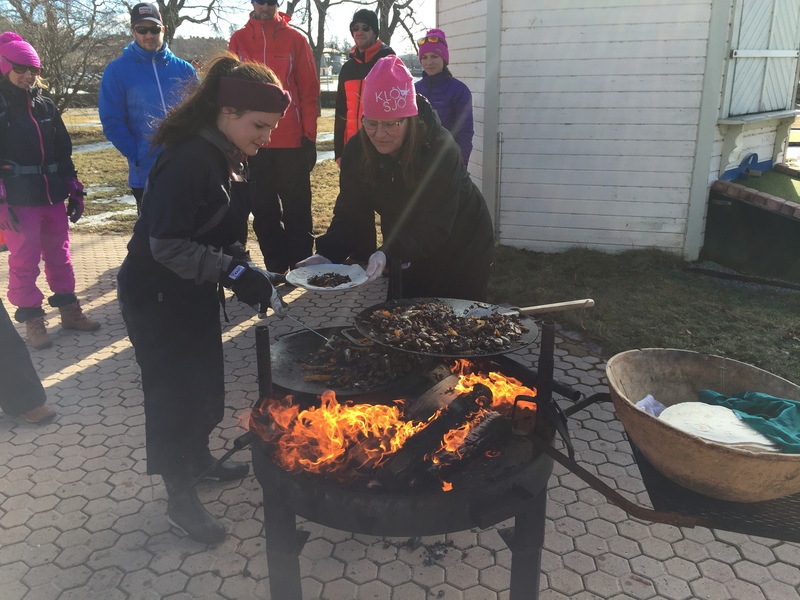 Since you will be working as hard as if you went Nordic skiing, similar apparel is useful. On a windy, 20-30 degree Fahrenheit day, I was comfortable in my Columbia Roffe II Ski Pant with Omni-Wind Block and Trask Mountain TurboDown Jacket (Fall ’15) wearing just an Omni-Heat base layer beneath.